The Marching Mustangs are the fall component of the Unity High School Concert Band. Members of the band participate in the Marching Mustangs each fall. 2011 was the start of the Marching Mustangs going competitive with their field show. The Marching Mustangs perform at every home football game, community events, and at various parades and field show competitions. The band practices before school three days a week as well as every day for 46 minutes during school. 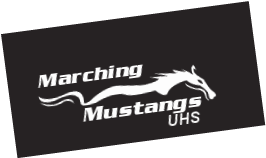 The Marching Mustangs showed off their new uniforms and trailer in 2012.